Escape Metropolitan Medellin til fordel for Guatapé (Pueblo de Zocalos), hjemsted for den storslåede Peñol Rock (La Piedra del Peñol) på en 12-timers tur fra City of Eternal Spring. 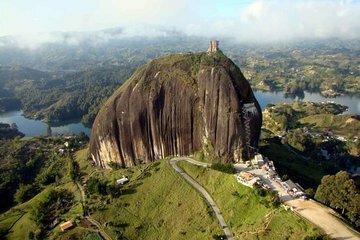 Ud over de 742 trin, der fører til toppen af Peñol Rock (La Piedra del Peñol), besøger man traditionelle landsbyer som Guarne og Marinilla. Morgenmad og frokost er inkluderet. The tour beginning was confusing. I showed up at 7am for 7:45 start but bus didn't show till 8:35am , no one speaking English till then . After that awkward start the tour went well, breakfast and lunch were good and tour guide spoke good English. Maybe its not always like that, but the day we went, it was rammed with tourists, to the point of wondering when it was all going to collapse. Several buses were jockeying for position and time slots at the various halts. You spend upwards of 4 hours bouncing about on the back of one of these buses. iphone said I'd climbed 188 flights of stairs at the end of it - my spine will never be the same again. While one of the 'guides' tried hard, the other looked as though she could freeze water just by looking at it. While the rock is odd, the views and countryside are beautiful - no need to climb it. 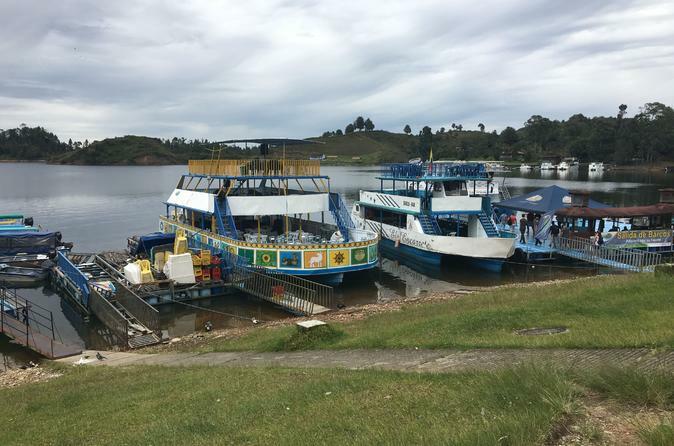 Guatape is picture postcard colourful but was also mobbed. Favourite was the all too brief stop in Marinilla - a proper Colombian town. This was where the guide told us about a collapsing building and then proceeded to lead the group under the collapsing roof. We went to the pub. Great tour - really good value for money you see quiet a few things, breakfast and lunch is included and you get plenty of time to take pictures. Overall, this tour is a great deal. You get two guides (Spanish and English), a really comfy bus, and a well spaced out full day tour that includes a breakfast stop (arepas and Colombian coffee or hot chocolate), a brief tour of the historical town of Marinilla and then the main attraction - time to go up El Penol, an included lunch at a local restaurant, a guided tour of the town of Guatape + free time. Other tours make you spend a long time on a bus to get to the intended destination. I thought this tour spaced the day out really well. As a bilingual English/Spanish speaker, I do believe our group's Spanish-speaking guide (Patricia) did a much better job than the English-speaking guide (Jesus), who seemed to be 'phoning it in' and omitting a lot of details. The tour was incredibly memorable and well worth it! Jesus was an awesome tourguide... very informative, welcoming, happy, fun. Awesome trip with lots of that sweet Instagram gold that you know you want. I would totally do it again! Lovely tour where you get to see the best of Guatapé, Peñol and surroundings. The guides were extremely professional and friendly and good story tellers. Thank you Jesús and Paula for a wonderful trip! Agree with previous reviews - great value for your money, the sites were lovely. Amazing way to spend a day outside of Medellin. My boyfriend and I had a wonderful touring experience! Two pick up locations were offered for convenience and we met the bus/staff at a park. We selected an English tour guide, but there was also the Spanish guide there as well that spoke directly to our Spanish speaking tourists. Check in was easy and the bus was very comfortable. We made a couple of stops before and after the "main event" at lovely little towns. Here our guide gave us guided tours and then allowed free time. Two meals were also included in this; an arepa with local cheese for breakfast and then our choice of one from 3 or 4 dishes for lunch. The food was very good. Once at the guatape rock we also had the choice of paying extra and climbing the stairs to the top or just to remain at the bottom...we of course had to see the view from the top! The stairway was built outside of the rock, so there was plenty of air flowing and beautiful views along the way, in case you needed to stop for a breather. It was a great workout, but one that any able bodied person can do if they pace themselves. The view was incredible! Really, a once in a lifetime experience. Would definitely recommend this tour for any one traveling through Colombia!